"Architecture is too important to be left to architects alone. Like crime, it is a problem for society as a whole." Berthold Romanovich Lubetkin (December 14, 1901 — October 23, 1990) was a Russian émigré architect who pioneered modernist design in Britain in the 1930s. 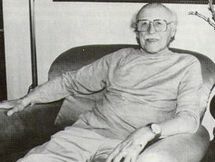 Born in Tbilisi, Georgia, Lubetkin studied in Moscow and Leningrad where he witnessed the Russian Revolution of 1917 and absorbed elements of Constructivism, both as a participant in street festivals and as a student at VKhUTEMAS. Lubetkin practiced in Paris in the 1920s in partnership with Jean Ginsburg, with whom he designed an apartment building on the Avenue de Versailles. In Paris he associated with the leading figures of the European avantgarde including Le Corbusier. 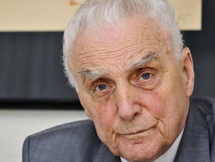 He continued to participate in the debates of Constructivism, designing a trade pavilion for the USSR in Bordeaux and participating in the Palace of the Soviets competition, for which his entry was shortlisted. Emigrating to London in 1931, Lubetkin set up the architectural practice Tecton. 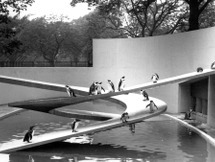 The first projects of TECTON included landmark buildings for London Zoo, the gorilla house and a penguin pool (clearly showing the influence of Naum Gabo). Lubetkin and Tecton set up the Architects and Technicians Organisation in 1936. Tecton were also commissioned by London Zoo to design buildings for their reserve park at Whipsnade and to design a completely new zoo in Dudley. Dudley Zoo consisted of twelve animal enclosures and was a unique example of early Modernism in the UK. All of the original enclosures survive, apart from the penguin pool, which was demolished in 1979. Tecton's housing projects included private houses in Sydenham, the UK's only modernist terrace at 85-91 Genesta Road in Plumstead, south London, and most famously the Highpoint apartments in Highgate. Highpoint One was singled out for particular praise by Le Corbusier, while Highpoint Two exhibited a more surreal style, with its patterned facade and caryatids at the entrance. A detached three bedroom villa (Heath Drive, Romford) which won a Gold Medal at the local '1934 Modern Homes Exhibition' is interesting in that study of its layout and the floating horizontals of the elevations strongly suggest that it was used as a design prototype for Highpoint One's final form. Sympathetically restored under the supervision of English Heritage and listed Grade2, this villa is regarded by many as demonstrating the best features of the Tecton group style. The Labour Party council in the London borough of Finsbury were major patrons of Tecton, commissioning the Finsbury Health Centre, which was completed in 1938. Lubetkin and Tecton's achievement in Finsbury was to unite the aesthetic and political ambitions of Modernism with the radical municipal socialism of the Borough. The health centre resolved the tension between three key modernist ideals. First: a social function; universal access to healthcare free at the point of use for the borough's residents (a decade before the NHS). Second, the political; no longer was social good to be achieved through charity or hope, instead it was provided by a democratically elected and accountable municipal authority, funded through local taxation. And third, the element which made Tecton's work unique, the aesthetic. The building's tiled facade shone above the surrounding slums, its rational conception asserted the ideal of a socialist future as the rational endgame to progress; in Lubetkin's words the architecture "cried out for a new world". Lubetkin's modernism - 'nothing is too good for ordinary people' - laid down a challenge to the class bound complacency of thirties Britain. But Tecton's plans to replace Finsbury's slums with modern flatted housing were stopped by the onset of war in 1939. Paradoxically the war would move Lubetkin's work from the radical fringe to the mainstream. As the fighting progressed, the British government became increasingly committed to the idea of building a fairer society when peacetime came. As this was articulated through propaganda, Modernist architecture became the visual expression for this radiant future. Abram Games designed a series of posters comparing the promise of modernism, one featuring the Finsbury Health Centre, with the appalling realities of pre war Britain. The uncompromising title to each poster was: 'Your Britain- Fight for it Now'. A further sign of this political shift was the erection in 1941 of a statue in memorial to Lenin. Designed by Lubetkin, the memorial marked the site of Lenin's lodgings at Holford Square, London in 1902/3. Vandalism by British Fascist groups resulted in the monument being placed under 24-hour police guard. The post war Labour victory was built on the promise of modernism as pioneered by Tecton. The Finsbury Health Centre became a model for the new National Health Service. To confirm the significance of Lubetkin's vision, the Minister of Health Aneurin Bevan laid the foundation stone to Tecton/Finsbury's Spa Green Estate in winter 1946. This was the first of a series of housing projects for the practice including Finsbury's Priory Green Estate and Tecton's work in Paddington (led by Denys Lasdun) at the Hallfield Estate. These all showed a more decorative, patterned style which contrasted greatly with the Brutalist style that was soon to emerge as the dominant form of welfare state architecture. For most of these projects Lubetkin and Tecton worked closely with Ove Arup as structural engineer. In 1947 Lubetkin was commissioned to be master planner and chief architect for the Peterlee new town. The following year Tecton was dissolved. Commenting on this, Lubetkin wrote to fellow Tecton member Carl Ludwig Franck "that after the war Tecton was at best a ghost of its former self". Lubetkin's masterplan for Peterlee included a new civic centre for which he proposed a number of high rise towers. However the extraction of coal was to continue under the town for several years which posed a risk of subsidence. As a result the National Coal Board (NCB), itself an agency of the Ministry of Fuel and Power would only consider a dispersed low density development. Despite investigating a number of options that would have allowed coal extraction to continue without preventing the proposed development, the NCB would not alter their policy. As Lubetkin was the employee of the Ministry of Town and Country Planning this developed into an inter-ministerial battle, and despite attempts at dispute resolution at cabinet level the difference in approach between the ministries remained. Frustrated at the unresolved bureaucratic battles, Lubetkin resigned from the Peterlee project in spring 1950. The only physical sign of his involvement in the scheme exists in the adjoining opposed parabola forms of the road layout at Thorntree Gill. Lubetkin returned to Finsbury to complete (in collaboration with Francis Skinner and Douglas Bailey) his final project for the Borough. Intitially named Lenin Court the housing scheme was to incorporate Lubetkin's Lenin Memorial. Post war austerity had imposed far greater budgetary constraints than in the showpiece Spa Green Estate, forcing Lubetkin to strip the project of the basic amenities he had planned; there were to be no balconies, community centre or nursery school. Instead Lubetkin focused his energies on the social space. Fusing his aesthetic and political concerns he created a stunning constructivist staircase - a social condenser that forms the heart of the building. But the scheme marked a shift in British housing policy. To save costs, Lubetkin successfully made significant use of prefabricated floor and wall components. Less beneficially, the diminished social provision forced on the architects by the reduced budget would be repeated with far worse consequences across post-war Britain. And also beyond the control of the architects was a political statement. Before the building was completed the Cold war had intensified and as a result the scheme was renamed Bevin Court (honouring Britain's firmly anti-communist foreign secretary Ernest Bevin). In defiance, Lubetkin buried his memorial to Lenin under the central core to his staircase. To this day it underpins the social heart of the building, perhaps waiting for a more promising future. Tecton's work would also be a major influence on the Festival of Britain. However Lubetkin's efforts to gain employment with the London County Council (the authority with responsibility for building the Festival) were rebuffed. Frustrated, Lubetkin spent increasing time at the Gloucestershire farm he had managed since the start of WWII. Though he failed to win several design competitions during the 1950s, he (again with Bailey and Skinner) designed three large council estates in London's Bethnal Green (now a part of Tower Hamlets). These schemes, the Cranbrook Estate, Dorset Estate (which featured the tower Sivill House) and the Lakeview Estate all made increased use of precast concrete façade panels while developing the idiom of complicated abstract facades and Constructivist staircases established in the 1940s. Lubetkin eventually moved to Bristol where he lived with his wife. He campaigned in later life to protect the views of Brunel's Clifton Bridge; for Lubetkin, Brunel epitomised the spirit of technological progress which had first attracted him to England. In 1982 Lubetkin was awarded the RIBA Royal Gold Medal. He died in Bristol in 1990. Lubetkin was the subject of a Design Museum exhibition in 2005. His daughter, Louise Kehoe, published an award-winning memoir in 1995 which included previously unknown details of Lubetkin's early years.